"The Rings of Love" symbolizes the everlasting bond that a couple undertakes while standing under the Chupah. The rings themselves embody a couple's love for each other, as well as symbolizing the new life long bond that they have undertaken and interwoven between themselves from the time of the Chupah and onwards. The lion is symbolic of the tribe of Judah and the power of love, honor and belief between man and his fellow man and man and God. The lion is also the eternal symbol of Jerusalem and her everlasting rays of gold. 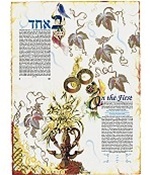 In this ketubah, the lion also signifies the strength of the new bond that the couple have just undertaken together. Together the rings and the lion serve as a testament to the strength of love that both the bride and groom now share together. The ring, though small, is complete and encompasses all. The two rings remind us that although we remain as separate entities we are joined together with the Infinite in our marriage. This spectacular Giclee print is signed and numbered and created on archival artist paper or canvas. 31" x 20"